"It is worth a posthumous Pulitzer for non-fiction. You and Maris can share the Nobel prize for peace." "Private Loring M. Bailey Jr. was killed on March 15, 1970 in Quang Ngai fighting in the Vietnam War. He was from Stonington, Connecticut, and was only 24 years old. In the “Remembrances” section below his name on the Vietnam Veterans Memorial Fund website, John Wilson, his platoon leader, recalls the exact time it happened: “I was standing there with him discussing our defensive options. We stood in the same area while discussing the options. . . and as I walked away, there was a booby-trap explosion that killed Loring but just threw me to the ground. To this day I don’t know how or why I survived and he did not.” Although Ring, as he was called, didn’t make it home, his words live on in a soon-to-be-released book, Calm Frenzy: One Man’s Vietnam War. 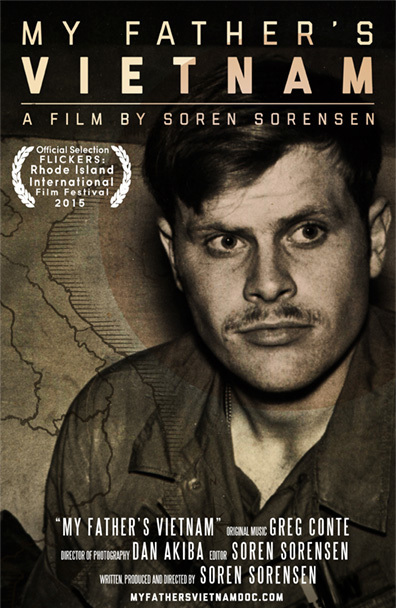 The book will be released on Veterans Day, November 11, at the Main Street Landing Film House, Burlington, alongside a new award-winning documentary film from Soren Sorensen called My Father’s Vietnam, which is in part about Loring and his relationship with Soren’s father during Vietnam. Calm Frenzy is a series of edited letters to Loring’s wife, Maris Bailey, his parents, Loring Sr. and Dorothy, his brother-in-law, Rik Carlson, who works at the Little Garden Market in Charlotte and a close friend—the same people who helped compile the book. The letters, mostly given without dates or addressee, paint a disjointed but candid picture of Vietnam, from basic training to a “360 degree front,” through the eyes of a curious mind and a gifted writer. Loring would have been 70 years old on October 24, 2015." "Loring (Ring) M. Bailey was my, ex-husband, David and my friend whose letters from “Viet Nam” to us, his wife, parents and others are thoughtfully written. This is significant to recognize considering the conditions from which he was writing. When he wrote by flash or candle light from extremely uncomfortable, wet, muddy and bug infested environment, with the screaming sounds of war surrounding him, I am reminded most Americans were safely home, barely satisfied to watch the nightly news and to receive our daily “Nam” death counts from Dan Rather. We watched the news like some today, watch reality shows. Ring’s experience and perspective provide an added intensity to the sorrow and grief of young lives lost in war and especially in an unnecessary one. For me, his writings unintentionally shame us because in the chaos of war Ring retained his humanity. The following Haiku (Japanese style poetry) I wrote for Memorial Day and thought it was fitting to repeat here. "At long last, I just finished reading Calm Frenzy. It is so many things at once: a compelling anti-war statement, depicting the gut-wrenching bleakness of war seen through the eyes of a young man just beginning his life's journey; an indictment of the specific pointlessness and cruelty of the Vietnam conflict; the story of the loneliness and isolation of one young soldier being propelled along by forces beyond his control to participate in an almost unreal, but life-threatening, experience; a glimpse at the inner soul of a man trying to reconcile and understand disparate emotions--love, loyalty, duty to kill, respect for life--and expressing that struggle in often forlorn letters home. The letters reveal Loring's innate intelligence and sensitivity. You cannot help but be impressed by his writing ability (for such a young man) and wonder what he might have produced had he survived the war. At one point, he mentions that the letters are written down and sent without review or edits--an impressive feat. I have re-read a few times the handwritten letter that is reproduced on pages 145 through 151. It could make you cry. He sounds like a drowning man who is struggling to maintain his connection to a now-distant world and people who were once his mainstay and proof of his very existence and are now fading away or falling beyond his reach. He wonders whether, if he survives, he will ever actually return to that existence. What a burden for a 25-year old man! This must have been very difficult for his parents to read when editing the letters. Even knowing the tragic outcome, I was constantly hoping that this ending could be avoided. There was a deafening silence on page 173 when the letters end and his final sentiment is "To be remembered is an honor, and the whole of my object". And then silence.... It was good of you and others to publish these letters and allow others--even strangers like me--to honor Loring by remembering him. " "Deploring the deep-seated dependency of Vietnamese on American aid, Loring M. Bailey Jr. wrote: “I’m enough of a youthful socialist to admit that not everybody can pull themselves up two hundred years by the bootstraps, but there’s such a thing as burdensome assistance. Enough. As the oriental sun sets gently over the snipers and touches its last golden rays to the olive Claymore mines, we bid adieu to Vietnam, land of mystery and mangled civilians.” A booby trap killed Bailey on March 15, 1970, five months after he arrived in Vietnam at LZ Liz, near Chu Lai, and joined the Americal Division. Spec 4 Bailey had been a radio-telephone operator for both his platoon leader and company commander during what was to be an eight-month tour to finish his enlistment. Under the battalion’s policy, companies spent three weeks in the field and then one week at Liz. Loring “Ring” Bailey died at the age of twenty-four, but his spirit lives on in Calm Frenzy: One Man’s Vietnam War (Red Barn Books, 175 pp., $15.95, paper). The book is a collection of letters that Bailey wrote to his wife, parents, and three best friends. Chip Lamb adapted the letters into a stage play before they became the basis for this book. Bailey was a literary magician—a man who plucked the right words from thin air at exactly the right moment, often as a grunt in mud and rain. His sense of humor was enviable. For example: “Just a dreary way to spend a hot, moist night, sitting, listening to your rifle rust.” “I have a new fantasy—I pretend that I’m a Belgian mercenary and this isn’t my war, I just work here.” After he adopted a duckling: “When he made his pitiful little squeaks, I agreed with him.” To his wife, Maris: “You’re nice to love and hard to be away from, better than Dinky Toys and bigger. 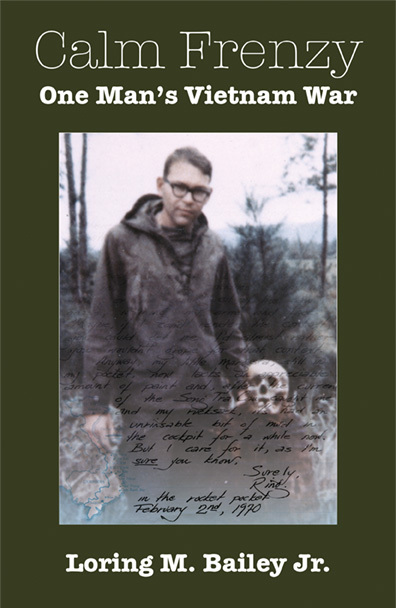 You must be real.” Through Bailey’s eyes, we see a Vietnam War in which the American quest was futile, yet he persevered. He found a close parallel between the Americans in Vietnam and the British in the Revolutionary War. To wit: “We’re really having asses made of ourselves and paying well to have it done.” Bailey’s reflections on his activities contained a philosophical tone mixed with touches of poetry and surrealism. His crisply written, sometimes convoluted, scenarios challenge a reader’s imagination and lead to unexpected conclusions. He seldom spoke directly of combat. His greatest concern was for civilian casualties, particularly women and children. Yet Bailey foreshadowed his own death by noting: “Three of our third platoon people were killed by a booby trap while setting up for an ambush; one lived nearly a whole, precious, peaceful day, afterwards.” And soon thereafter: “More booby traps and such in evidence now.” The book provides no account of Bailey’s death. When I turned the final page, I grew teary eyed. I believe Ring Bailey would agree that he qualified as a poster boy for “The Waste of War.” He died just when he was beginning to live—like all the other young KIAs of Nam." "My Father's Vietnam" is a powerful and gripping story---a worthy testament to complex lives and impossible choices made by young people coming of age while the world was in flames. These accidental heroes---soldiers, resisters, the women who waited and worried---emerge as fully human beings thrust into situations not of their making, struggling to make sense and create meaning out of chaos. This is a dazzling documentary and a necessary addition to the chronicle of the Viet Nam years. "The horror, the horror of it all' came home, it didn't just stay in the war zone. 'Calm Frenzy,' the book, along with 'My Father's Vietnam,' the movie, strips war to the bone and tells you what history books and battle stories can't tell you. They expose the chaos of politics mixed with misbegotten war, any war, and the veterans who fought it. There is no glory, there is no honor, there is never justice, and there never is a winner in any war. What endures forever is the pain, the pain of it all. A "must" for all children and grandchildren who want to understand what is probably hidden or hard to figure out about a parent who was there. So, who am I to say this? Michael J. Olson, Ed.D. ; North Vietnamese Linguist, Combat Veteran with 4 USAF Air Medals plus 2 1/2 years in the war theater, and Top Secret Cryptology cleared COMMINT voice intercept processing specialist. I was in it deep, dark and within the blackness. I hate what I know. I can't forgive self-proclaimed patriots who thought, and think now, that ANY war we have initiated in this lifetime are just or warranted. They are not. They propogate and spread disaster for many generations to come, just like this generation is discovering in the current debacle of Iraq II, and once again many wish to shake hands, be grateful for service, but still ignore veterans. "When will they ever learn, gone to flowers every one." "I can’t recommend it more highly as the best ‘war’ movie I’ve seen since Apocalypse Now as far as capturing all of the crazy emotions." Sorensen's exploration of his father's experience in Vietnam opens the door to the tragedy of losing a loved one with so much vitality and hope for the future. Over 50,000 families live with such loss, and this story highlights how young men make personal connections, only to have them rent apart by war. I believe people continue to watch stories like this not to dwell on the tragedy, but because other generations still care about our collective history. My Father's Vietnam tells this story with respect and interest in who they were and who the survivors are today. Sorensen mixes interviews, personal photos and personal super 8mm film from their experiences to show one view of Vietnam in 1969-1970, which substantiates the story. I found that the simplest of requests, the single act of writing an article can alter one person's experience and in a real sense, save their lives. An important aspect to understanding those who served at that particular time is the sense of duty to the country - that when our leaders deem an action important, many young men feel that it's important to do their part. Many men, including those in this film, are and were moral men, in search of doing what was right on an individual level. That often gets lost when people speak about the Vietnam War today. Those we lose live on in our memories of them, and in the sharing of those memories, and that makes this film worth watching. This Memorial Day, we think of those brave men and women whose lives were lost during their military service. Some people celebrate the holiday with a cold beer in hand as they relax from an extra day off of work, while some people pay respects to their loved ones at cemeteries and some stay in watching war related films. For those of you who watch war related films/documentaries, here’s one to add to your Memorial Day film list, My Father’s Vietnam. My Father’s Vietnam is a personal Vietnam story from director Soren Sorensen about his father (Peter Sorensen) and a couple of his father’s friends (Loring M. Bailey Jr. and Glenn Rickert), who served in the Vietnam war. Their stories, told by Peter (the only one which survived) and close family members, are accompanied by never-before-seen photographs and 8mm footage of the war. What sets this film apart from the rest of the war documentaries is that you get to hear different points of views from the family members of the soldiers and it also gives those soldiers a backstory. Often in war documentaries, you hear historians narrating over footage of the war, and sometimes you do get to hear from the actual soldiers who served in those wars but not enough to where you learn more about that particular soldier’s life before and after the war. By hearing from Peter Sorensen, Loring M. Bailey Jr. and Glenn Rickert’s families, you hear how much the war affected the whole family and shows the ripple effect of war. The documentary even talks about Peter Sorensen’s PTSD, which a lot of veterans suffer from after time in war. If you’re looking for a personal war documentary, this is it. It has emotional and personal stories about individual soldiers that sacrificed their lives, and I wish there were more war documentaries like this. It strips down everything and gives you so much insight about war and about the soldiers that put their lives on the line.